(CBS News) Welcome to The Feed's Supplemental Weekend Music Round-Up! While the regular round-up will come out a bit later, let's get the music started now as we all get ready for the weekend. 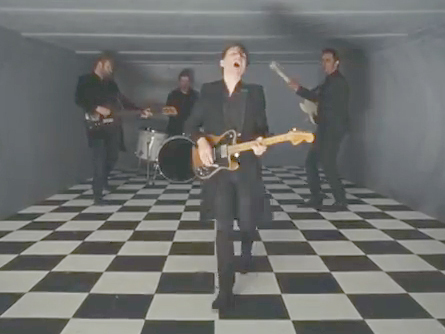 We're kicking things off with a little Franz Ferdinand and the music video for their second single off of their upcoming album "Right Thoughts, Right Words, Right Action" out Aug. 27. This video has a lot going on, to say the least. Directed by Timothy Saccenti, the band is set in a psychedelic fantasyland full of scantily clad women, elaborately costumed dancers, horse masks, and impressively artsy choreography. And while I would consider the video safe for work, be forewarned, there are some pretty risque moments that almost border on inappropriate. Regardless, it's a really cool video worthy of your undivided attention. Next up is a very ironic (well, not really, I just had to get that word in) reworking of Alanis Morissette's "Ironic," hilariously and accurately entitled "It's Finally Ironic." The YouTube description posted by creators Rachael and Eliza reads: "We rewrote Alanis Morissette's 'Ironic' so that it's finally ironic!" They sure did! Check out their YouTube page here, to read all of their actually ironic rewritten lyrics and notes for Alanis (you really must read them all, the song is brilliant in more ways than one). And for our request item, The Feed fan, Kathy Mckay, wrote in to ask for a previously featured violinist, the amazing Seth Gilliard, performing an epic rendition of Swedish House Mafia's "Don't You Worry Child." Click play to watch the video above that will certainly get you in the mood for a summer weekend. Seth certainly knows how to rock the electric violin, and I could listen to this version of Swedish House Mafia's popular song on repeat. Not to mention that the visuals are awesome, as the song is in sync with the amazing fireworks in the background, and it all takes place at a baseball game, the perfect summer past-time sport. And with that, I hope you all have a great weekend, stay safe, and be sure to also check out The Feed's regular Weekend Music Round-Up a bit later today!